Welcome to Almonds Restaurant! 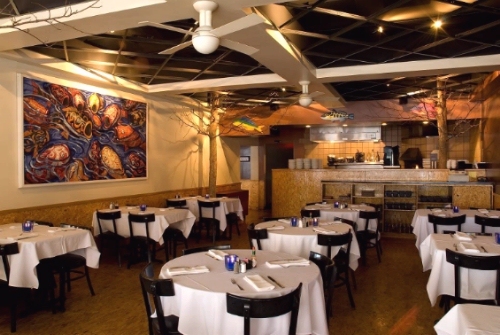 We invite you to enjoy a casual and comfortable dining experience in a sophisticated, white table cloth atmosphere. Our chalkboard menus at dinner offer delicious food selections and our servers provide warm and friendly service. Almonds Restaurant is located in the heart of Clayton and has been family owned and operated for twenty successful years. The cuisine is prepared by owner and Chef Tony Almond who, along with his wife Kelli, are present at the restaurant nightly to personally welcome diners. Both Tony and Kelli come from strong southern-based families with roots in Louisiana, Arkansas and Texas. This is reflected in the southern, down-home menu with selections including Chicken and Sausage Gumbo, Pan Fried Chicken, Cajun Shrimp, and Peppercorn Beef Filet. Excellent fish choices include Tuna Steak, Golden Idaho Trout, Grilled Salmon and Blackened Tilapia. Nightly specials include Pasta, Pizza and a delicious Risotto. We offer a full service bar and a hand selected wine list with a variety of choices to compliment your meal. Our lunch menu provides a large selection of Salads, Sandwiches, and Pastas. Our customers particularly love the Pizzas and Quesadillas from the wood-fired oven. At Almonds, it is our privilege to serve you! We appreciate the loyal support of our long-time customers and delight in welcoming those dining with us for the first time. Whatever the occasion, please join us for lunch and/or dinner at Almonds Restaurant.